George Washington’s two older half-brothers received a classical, Latin-based education at Appleby School in England. The unexpected death of their father, when George Washington was eleven, prevented him from receiving a similar education. Instead, private tutors and possibly a local school in Fredericksburg provided the young man with the only formal instruction he would receive. In addition to reading, writing, and basic legal forms, Washington studied geometry and trigonometry—in preparation for his first career as a surveyor—and manners—which would shape his character and conduct for the rest of his life. George Washington likely copied geometry problems when he was about 14 years old from The Compleat Surveyor, by William Leybourn, an English mathematician, teacher, and land surveyor. Nearly a century old by the time Washington used it, Leybourn’s work demonstrated how the geometrical rules and theorems developed by the ancient Greeks should be practically applied by the surveyor. Beginning with the basics, the first problems trained students to use simple instruments (such as a compass and rule) to create perpendicular and parallel lines, skills necessary to draft surveys. Gradually increasing in difficulty, later problems challenged students to divide irregular tracts of land into plots of varying sizes. George Washington's "Geometrical Problems," ca. 1745-1746, Courtesy of the Manuscript Division, Library of Congress, Washington D.C.
Washington copied these geometrical problems from the textbook, The Compleate Surveyor. Striking in their precision, Washington’s “Geometrical Problems” represent one set of exercises within a larger group of school papers that he produced as a teenager, between 1744 and 1748. These papers are the primary evidence for the scope and quality of Washington’s formal education, and document some of the earliest formative influences on him. Having been originally preserved by Washington himself, they also attest to the value he placed on their contents. Washington mastered seventeen of the problems provided in the text, presumably ones chosen by his tutor. 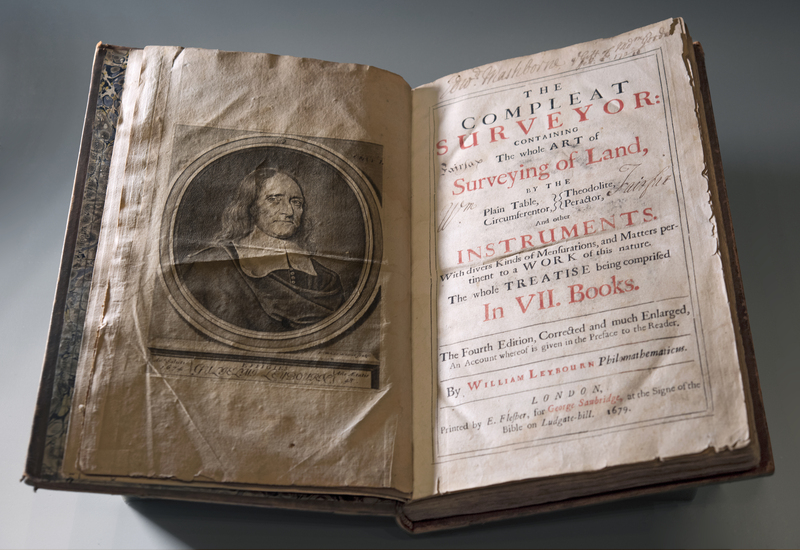 In 1747, within a year or two of completing the problems, Washington executed his first practice surveys, and in 1749 he secured the lucrative office of county survey in Culpeper County, Virginia. Even after years of experience in the fields as a surveyor, Washington appears to have continued to draw on Leybourn’s text as a reference. 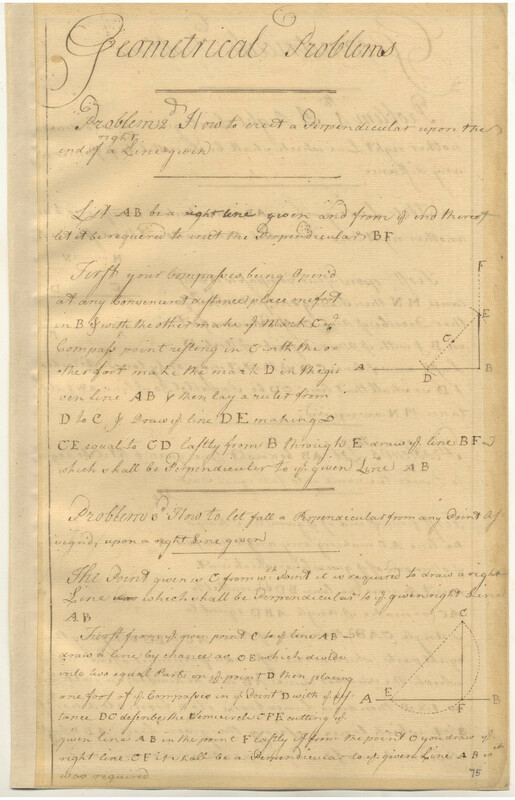 The circa 1764 “List of Books at Mount Vernon” includes “Leybourn’s Surveying” with a notation indicating that it had been borrowed from his neighbor, George William Fairfax (1724-1787). George Washington's Rules of Civility, ca. 1742-1747, Courtesy of the Library of Congress. 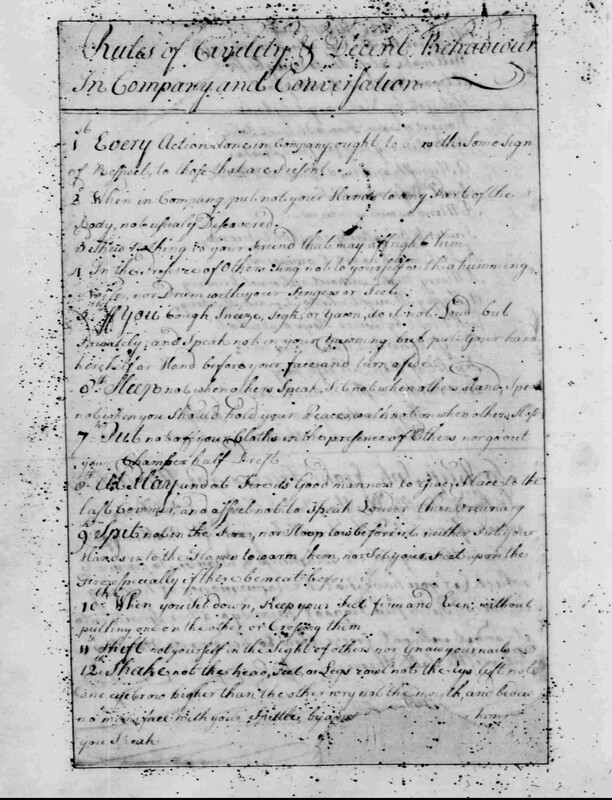 Towards the end of his schooling, George Washington copied out 110 “Rules of Civility and Decent Behavior in Company and Conversation.” These rules were drawn from a popular English text, Youth’s Behaviour, or Decency in Conversation Amongst Men, which was itself an adaptation of a 1595 work written by French Jesuit priests. The rules instruct students to practice consideration and respect towards others, by paying careful attention to body language, dress, and speech. In the 18th century, a lowercase "s" that appeared in the beginning or middle of a word could be confused with a true lowercase "f". Throughout his life, George Washington felt keenly embarrassed by his lack of a formal education, privately admitting that he was “conscious of a defective education,” and for good reason. The majority of the founders were college-educated gentleman who had spent years reading law and studying the classics. Washington was one of the few in his generation who rose to leadership without these advantages. The men who worked with him during his Presidency — John Adams, Thomas Jefferson, Alexander Hamilton, and James Madison — had assembled impressive resumés, and they were well aware of it. John Adams’ infamous and often cited claim that Washington was “too illiterate, unlearned, unread for his station” obscured Washington’s real record as a thoughtful reader for over a century. Not until the twentieth century did scholars, after studying Washington’s papers, begin to discover the true extent of his lifelong studies. The printed word, as much as the trials of battle, forged George Washington the soldier. The content on this page was adapted from Take Note! George Washington the Reader, an exhibition on view in the Donald W. Reynolds Museum & Education Center from 2013–2014.